I suspect there is selection bias here. On the one hand, we have Bitcoin, something we have no clue about how it'll turn out because it's an ongoing process. On the other hand, we have things we know to be bubbles for certain through history, and some of them will never have a good value again (Tulip). Just because they share some characteristics up till now doesn't mean you can make any kind of definitive predictions. Bitcoin could be in a bubble, or it could recover, or it could end up being totally useless, or it could be a very valued commodity because it has some great uses but its price might become stable at $5,000. Any of these things can be true. Does it look familiar? it starts off at ~$1 in '97, peaks at ~$85 in '99 (~85x the starting price, two years from peak) and crashed down to ~$6 on September 2001 (~6x the starting price, two years after peak). If we we had a similar graph back then, what would we have concluded about Amazon that will still be true today, 17 years later? Their stock price is now $715. It may still be in a bubble (thanks Federal Reserve! ), and their true stock price may be lower if there wasn't any inflation of the money supply. But in either case, Amazon is still valuable and useful, unlike Tulips and other such bubbles. Bitcoin may prove to be useful after all, or not; who really knows? 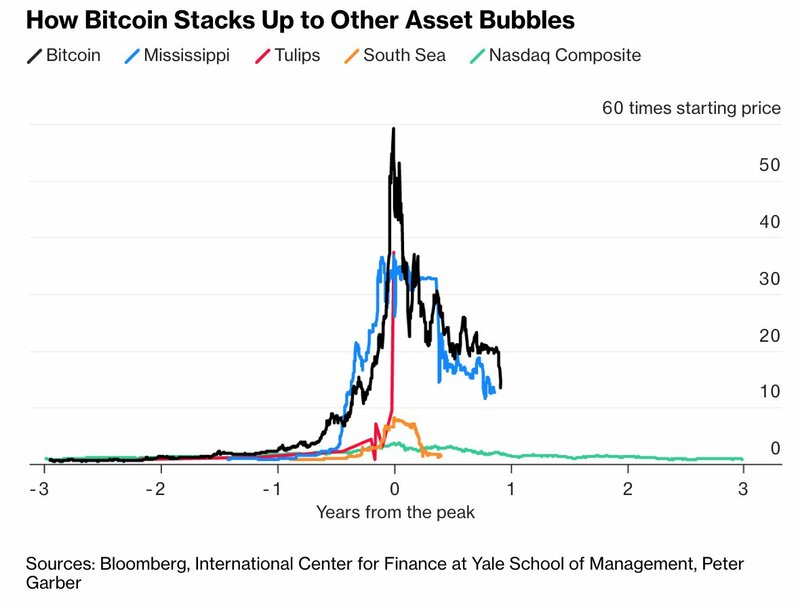 Who said that something has to be useless for it to be declared a bubble? Housing prices were in a bubble. Are houses useless? Amazon was in a bubble---but not a "permanent bubble." You're right, something doesn't have to be useless for it to be a bubble. You didn't state it here and I was not trying to suggest that either. I often do see discourse (not this post) where there is an underlying confusion that bubbles typically happen to mostly useless things, like Tulips. People often bring up pets.com as something that failed terribly during the dot-com bubble. It makes sense that when a bubble bursts, malinvestments disappear into smoke. I'm only trying to point out that although Bitcoin may be in some type of a bubble, it's too early to declare it as the crypto-equivalent of tulips or pets.com. It may end up being the equivalent of Amazon, something that gets hit hard but ends up being useful to a lot of people. It's too early to tell either way. Too early? Is it too early to call the housing bubble a housing bubble just because some people think its a good idea to reinflate their prices?